Coleraine’s theme tune this season has been ‘Proud Mary’, the Creedence Clearwater Revival song made famous by Tina Turner. It’s one of a select number of tracks on the Bannsiders victory playlist, so it has been blasting out of their changing room a lot this season. Unfortunately it wasn’t heard at the National Stadium on Saturday. The big wheels which have been turning all season came up against a very impressive Linfield side who added the Irish Cup to the League and County Antrim Shield titles already won. 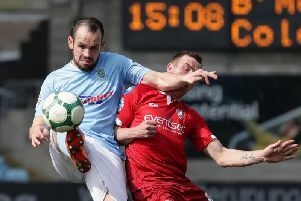 It was disappointing for Oran Kearney’s men, who have had an amazing season. But the bigger picture is the distance those big wheels have travelled this season has been massive - all the way to Europe in fact. Saturday’s cup final was a first for many in the blue and white, and come the end of June it will be another first as they play in the Europa League. They are certainly clocking up some miles now on their footballing journey. Last season Coleraine felt the hurt of crashing out of the League Cup semi final on penalties to Ards. That experience was banked and used as motivation for this term, and boy did it work. So when the dust settles from Saturday’s final everyone will see the Bannsiders have taken a massive step forward. That fact was not lost on the fans who welcomed the team back home on Saturday evening.Get your passports ready boys the wheels are about to start turning again!